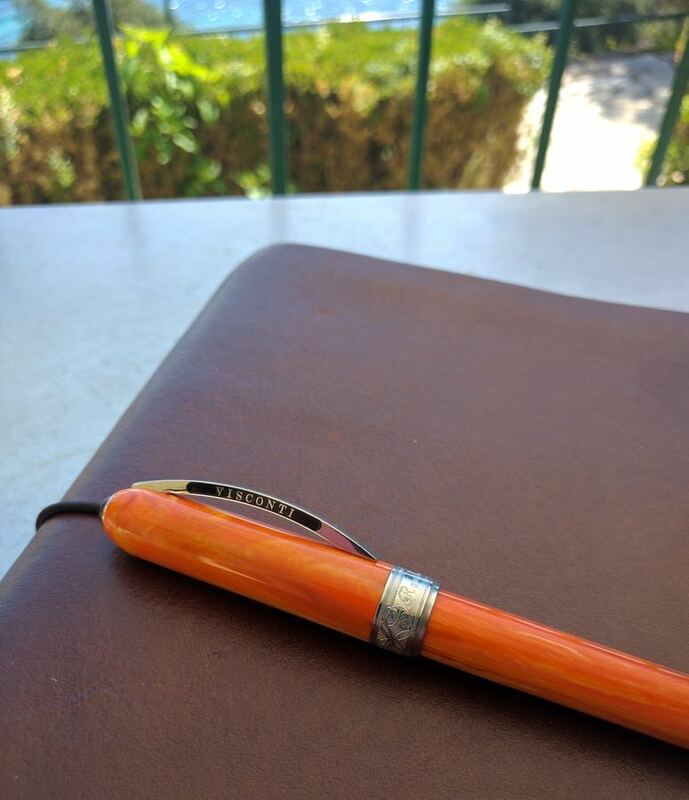 Visconti Rembrandt Fountain Pen Review – Pens! Paper! Pencils! Pick up the Rembrandt and it feels like a quality product. It has a weight to it and a feeling of solidity. It’s made from ‘variegated resin’ which, let’s face it, just means swirly coloured plastic, but it’s good quality and looks lovely. It does look very much as if it’s made up of thick brush strokes of paint. The end of the barrel is tipped with a chrome disc, which isn’t the greatest feature. The section is also chrome and if you find metal sections too slippery then you’re not going to like this one. It picks up fingerprints, too, though personally I quite like metal sections. 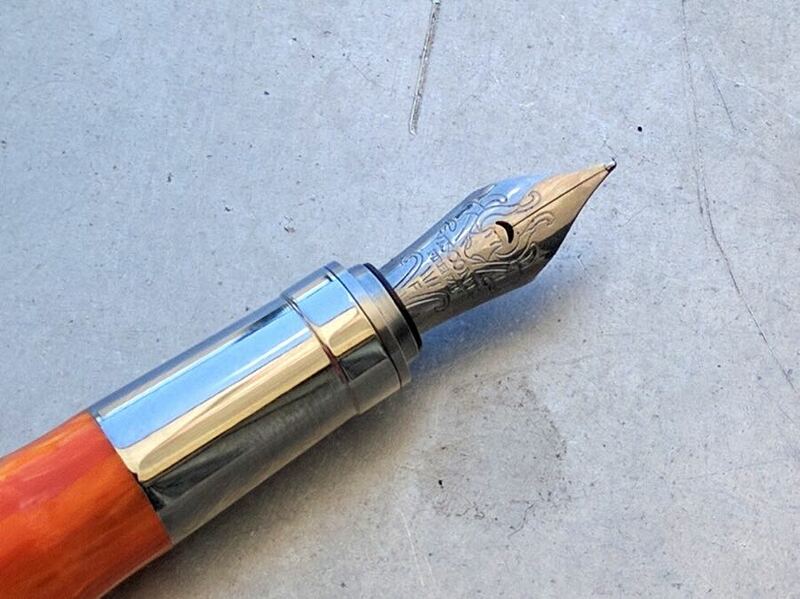 The stainless steel nib is very pretty, with lots of swirly etching. 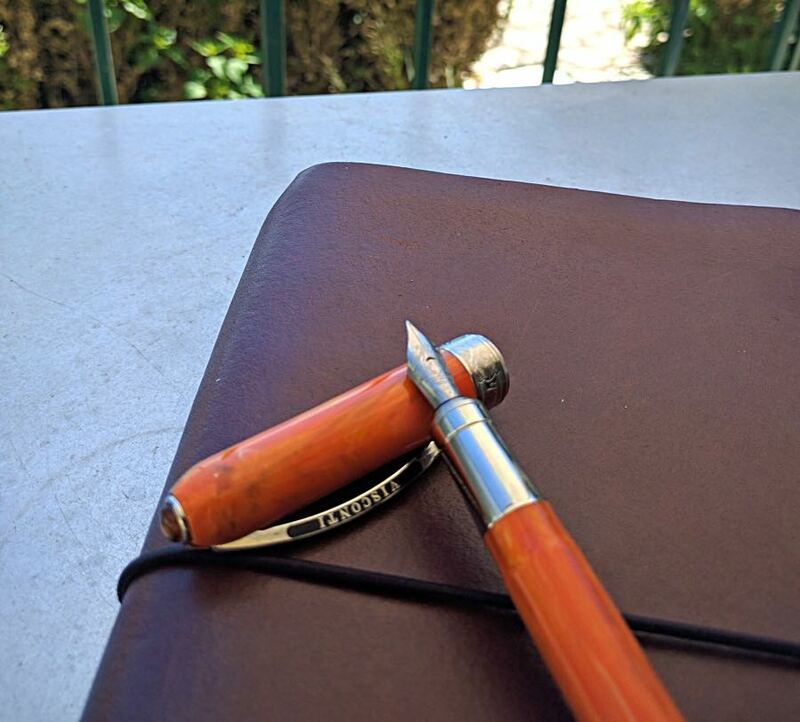 If a pen in this price range has a steel nib it had better be a very good one and fortunately in this case it is. It’s wonderfully smooth, with just a hint of feedback and good flow. It’s right up there with the best steel nibs you can get. The cap closes and posts magnetically. This works well and is fun to do. The pen uses standard-sized international converters or cartridges. 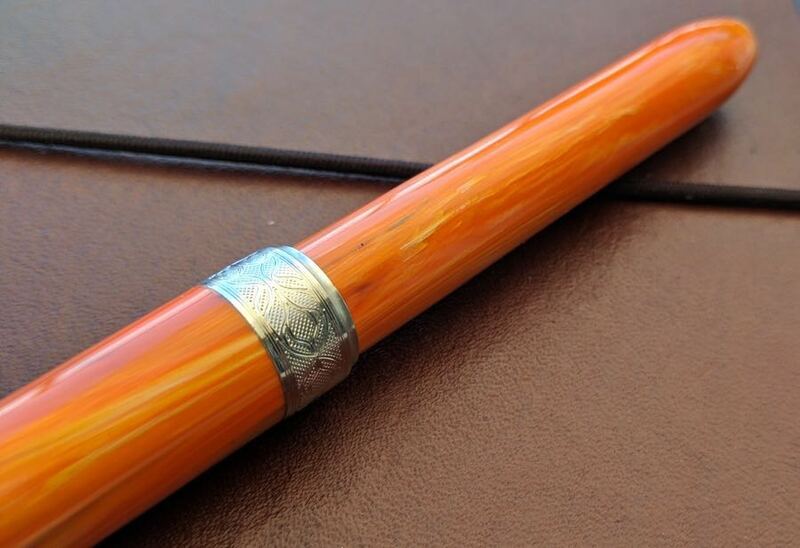 Visconti don’t really do subtle and with such a simple barrel their exuberance has to come out somewhere. In the Rembrandt’s case, it comes out with the cap. There’s a less than subtle cap band. There’s an orange jewel at the end. This can be replaced with a different colour or with your initials. This is the part of the pen I like the least, aesthetically, but that might just be me. 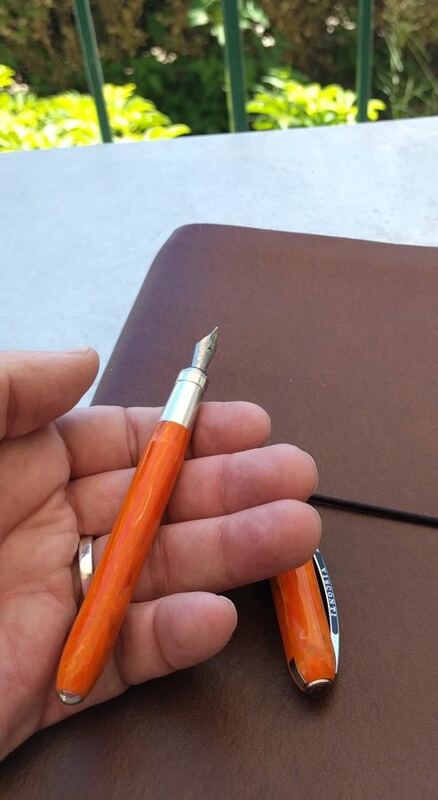 There’s the Visconti clip. Some people hate this. I love it. It’s sprung and works well as an actual clip, although you can’t just push it onto something because of its shape. The Rembrandt is an excellent pen. It has a great nib and a style all of its own. For me, it doesn’t quite have any magic about it though. 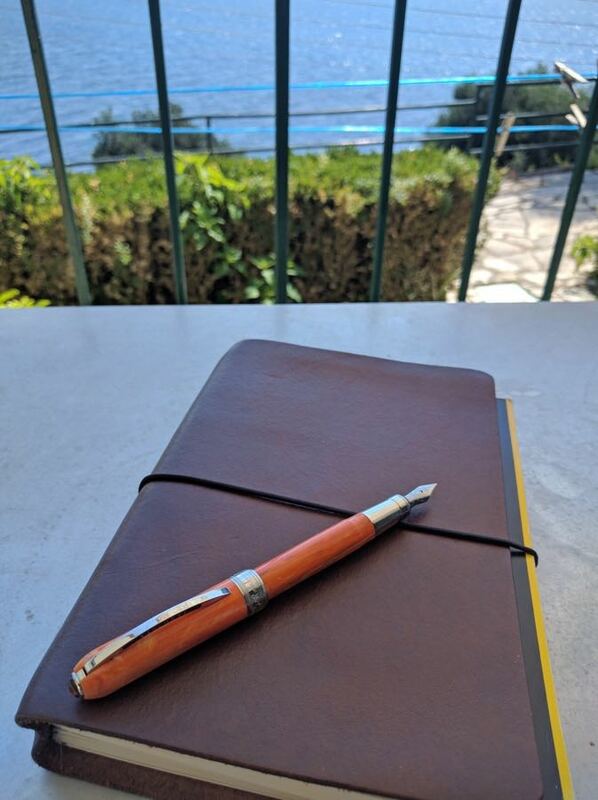 It is of course hard to explain why this is the case but I think that although each element is excellent quality the pen as a whole feels as if no-one really tried. The UK price is very high, too, and I can’t help but feel you’re paying a premium for the brand: for that love-it or hate-it clip. 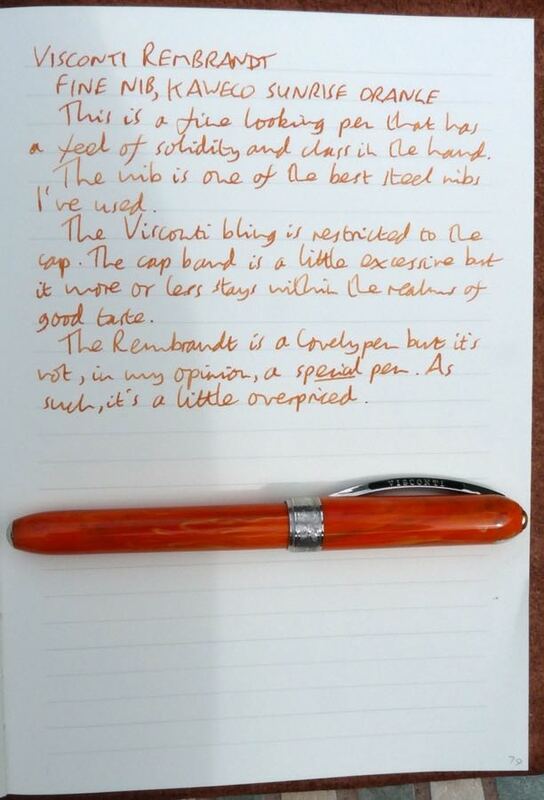 Thanks for the review Ian, It was my gateway pen to owning a Visconti but I couldn’t get past the metal section with sweaty fingers. Sold mine. My investment in a Homo Sapien is one of my best ever. I feel cheated – mine doesn’t have the Amber tassie in the cap, just another silver-coloured disc with Visconti on it. 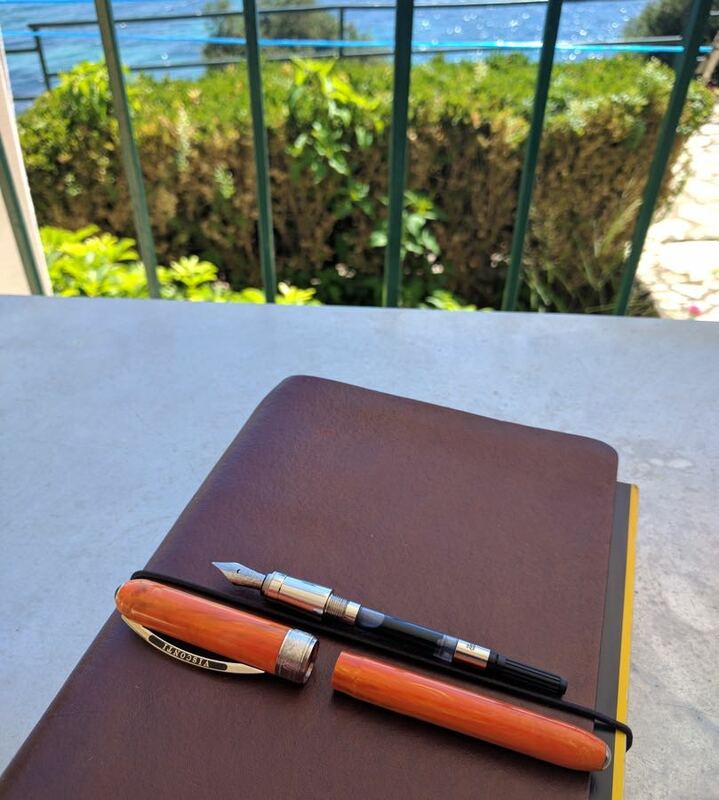 Love the pen though, and am considering getting another in red. IF I can find a bargain, they are over-priced.